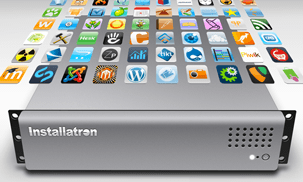 Since April, 2004, Installatron has pioneered a variety of web-application automation products to satisfy demand from businesses and website owners worldwide. From the original Installatron Plugin, which enabled just three applications for the DirectAdmin web hosting platform, to our current industry-leading product line up, we've had the honor of serving a long line of loyal and dedicated customers. Here's 8 of the many reasons to do business with Installatron. Doing business over 14 years. Headquartered in Pennsylvania and Florida, USA, we've been doing business since April, 2004. Utilize the wealth of experience we've accumulated over the years, and rest assured we're not going anywhere. We provide automation to millions of websites. With the number of websites automated by Installatron products in the tens of millions and growing every day, our product's wide use helps to assure product stability and ensure a smooth transition for new customers. We have proudly achieved numerous industry firsts and we aim to continue pushing industry boundaries. For a history of notable innovations we've introduced over the years, continue to the Installatron Milestones page. We pride ourselves in making web application automation straightforward and painless for everyone from experienced webmasters managing hundreds of applications to beginners setting up their first blog. Our products provide great value. Consider the features provided, the speed and reliability of application updates, the quality of the service received, and the ability to grow your business by leveraging our products' functionality and the Installatron brand. Great service is paramount to us. No matter what the problem, we're dedicated to ensuring all requests are answered satisfactory. 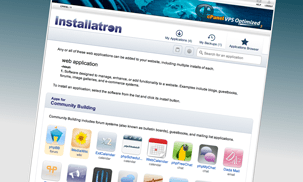 We're also happy to assist anyone using an Installatron product, whether they're using a paid or free license. Our customers come from all reaches of the globe. To serve a global audience, our products are available in multiple languages and most applications can be installed and upgraded in multiple languages too. We listen to and act on our customers' concerns and suggestions. Need one of our products to function differently? Need a payment due date extension? We have a long track record of flexibility—-don't hesitate to contact us. Supercharge your cPanel, DirectAdmin, and Plesk servers with comprehensive and easy-to-use web application automation features. Your customers will thank you for it! Web hosting and server providers of any size. Free for limited use. Starts at $2.50/month or $25/year for unlimited use. Licensed per server. Automatically migrate data from competing products like Fantastico. No migration is too big or too small. Add top web applications like WordPress and Joomla to your existing web hosting account. 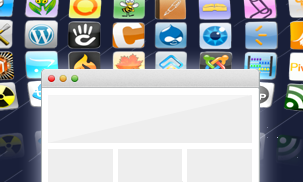 Setup your website in seconds and discover all that Installatron can do. Website owners whose web hosting provider doesn't offer Installatron. Free for typical usage. Advanced features and premium support can be unlocked for any number of websites for just $29/year. Integrate web application automation features into any web hosting platform. Improve customer retention, reduce support volume, and increase revenue. Medium and large web hosting providers using proprietary hosting platforms. Simply pay-as-you-go. No hidden fees or long-term contracts.